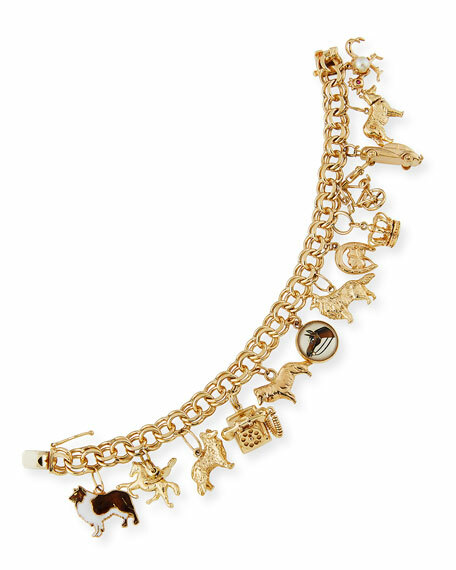 Hays Worthington vintage charm bracelet, circa 1950. 14-karat and 18-karat yellow gold. Thirteen crystal and enamel charms. Please note: Item descriptions and condition are as accurate as possible given the information available for the item. Please note that this is a previously owned item; imperfections are a unique aspect of vintage products. This piece is sold as is. For additional information regarding this one-of-a-kind item, please call call 1.800.824.5440 (available 24/7). For in-store inquiries, use sku #2165830.